It’s not easy sometimes is it?! Keeping your hair looking good, whilst trying to stick to a strict exercise regime. Sometimes that missed gym session literally boils down to not wanting to wash your freshly blowdried hair earlier than necessary. 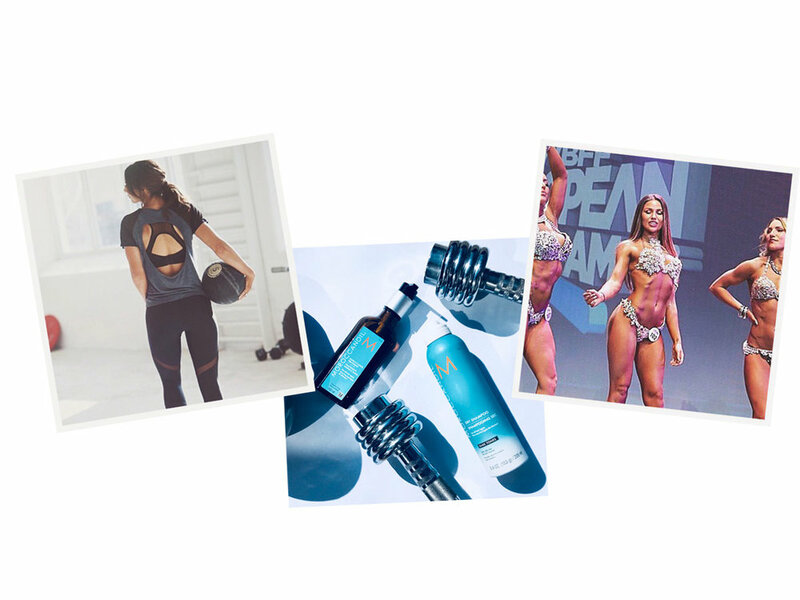 I’ve teamed up with Moroccanoil and Fitness Model, Chloe Francis, to share our go to tips to keep your hair looking its best during and straight after an exercise session to ensure your hair doesn’t give you one more thing to worry about in the small 24 hour window we have to fit everything in! Chloe is currently a WBFF Pro 2018 European Champion, a titled earned after following a strict diet and exercise routine in the lead up, and long before the competition. Earning this title wasn’t easy and sometimes Chloe can exercise twice a day. (Pure crazy!) 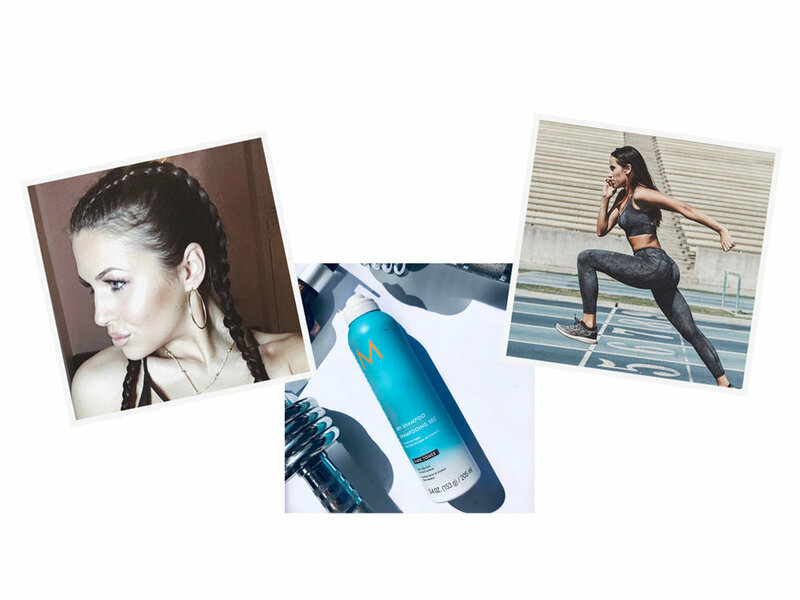 To maintain and style her long, balayaged hair it’s all about having the correct products in her gym bag. 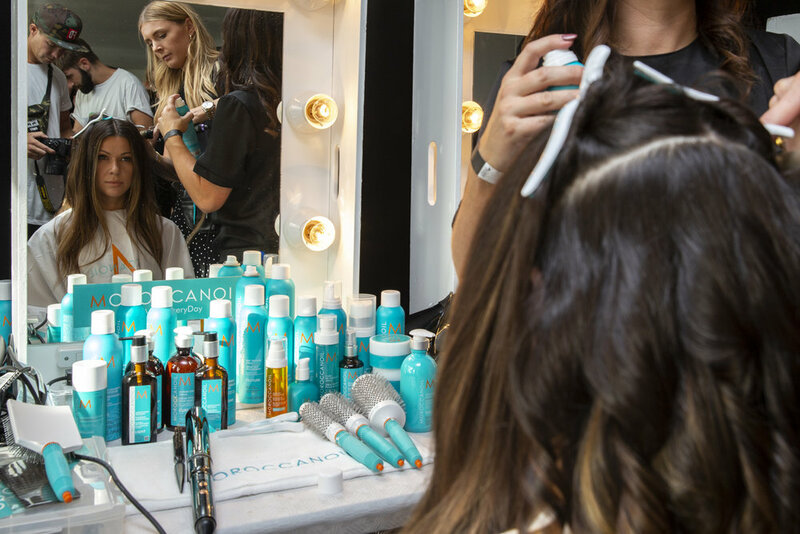 If you’re yet to discover Moroccanoil Dry Shampoo your life is about to be changed for the better! Described as the ‘holy grail’ of gym hair care, this little miracle will make sweat disappear right before your eyes. You need not worry about that talcum powder effect caused by some dry shampoo’s as the Moroccanoil Dry Shampoo comes in 2 tones (light and dark) to suit all hair types, whilst a rice starch is used to absorb the natural oil. If that isn’t good enough Moroccanoil Dry Shampoo also deodorises, because let’s face it smelling good post gym session is an absolute must. The only real shame is you can’t use it on the rest of the body. To get the most from Moroccanoil’s Dry Shampoo Dark Tones, Chloe will spray down her parting and around her hairline BEFORE her work out, to make it work just as hard as she does during the workout. This means you can go about your day without having to worry about a post gym hair wash and blowdry, it may even give you a few extra days depending on your hair type. Chloes second ‘go to’ is the Moroccanoil Treatment Oil Original. Since using the Treatment Oil, Chloe has stopped straightening her hair as the product alone is enough to smooth down any frizzy fly aways, usually caused when exercising. Chloe uses Moroccanoil Treatment Oil Original everyday on wet and dry hair. Not only to keep her hair smooth but to hydrate and treat her mid-lengths and ends. 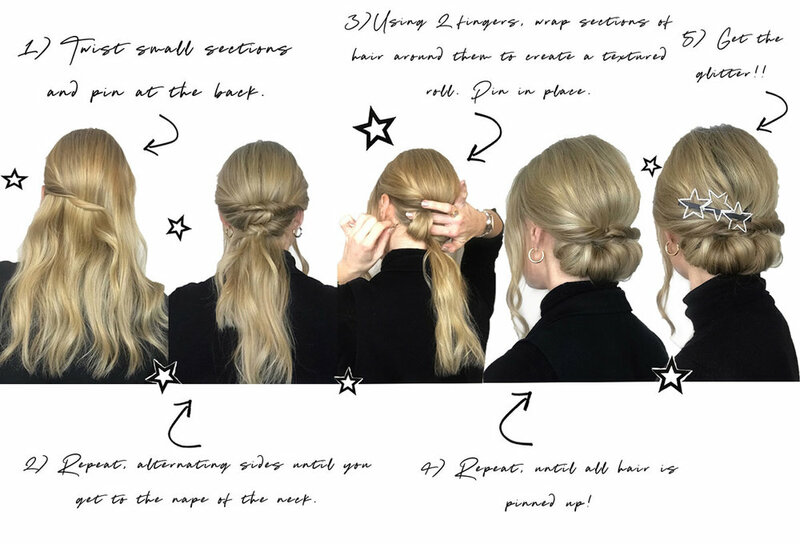 Next up is styling, and we all know the easiest style to exercise with is the 2 second top knot. But if the topknot is too tight, it can be damaging to your hair and also cause uncomfortable tension headaches. Unless you’re gently combing all your hair in the same direction before securing it, opt for something a little looser that doesn’t put pressure on individual strands of hair. Chloe’s go-to look is 2 Dutch Braids (Boxer Braids) to keep her long hair off her face and to stop it getting in the way. As much as this still looks tight and secure, each section of hair doesn’t have far to travel and can easily be loosened once the style is secured with a band. This look is not only exercise friendly, it can last the rest of the day. When the braids are removed, and (more!) dry shampoo applied, a beautiful volumised wave is created. With all that being said, the most important thing is that you feel comfortable when you exercise. If for you that’s having your hair done or going au-natural, it’s whatever works! Either way, I hope these tips help you save time whilst still maintaining fresh, healthy hair. I’d asked Janet if she’s be up for seasonal colour tweaks, and explained it didn’t necessary mean going from one extreme to the other. 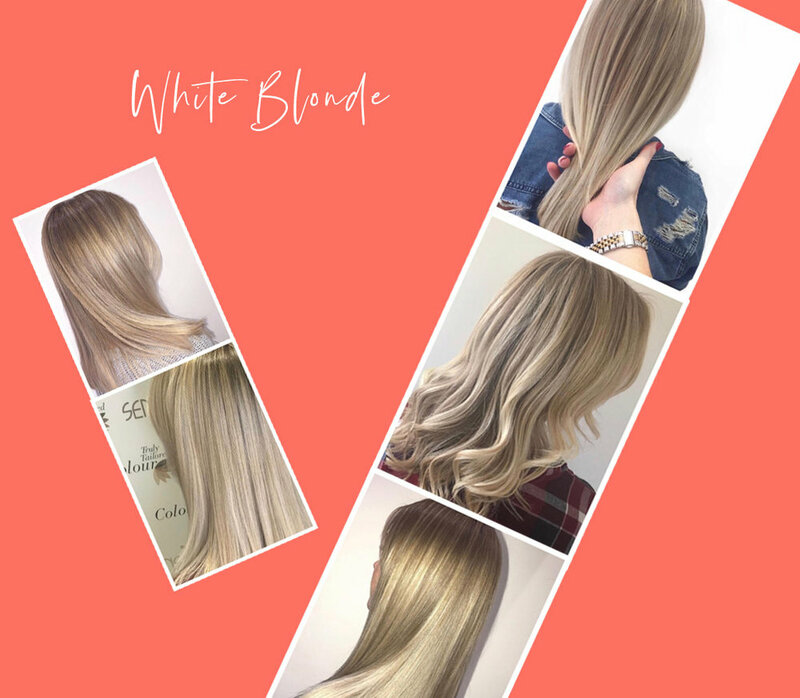 Our mantra at Pure Hair is ‘Better Than Natural Looking Colour.’ and I wanted to showcase how the use of balayage and blended colour can be changed frequently, whilst maintaining good condition and a different look that can still work with your skin tone. Janet was happy to oblige, and we spent our first appointment discussing options for the year ahead! First up, a lift for spring. This appointment being the lengthiest appointment due to removing previous colour. A 4 step process including 2 Zalon colour removers, a root tint and balayage, followed by a toner. Zalon is a colour remover that only removers artificial pigment from the hair, making sure zero damaged is caused. (Some colour removers bleach the hair, therefore removing artificial and natural pigment, causing dryness and damage.) I believe this gentle colour remover set me up in good sted for our spring/summer transition to blonde and help keep Janet’s hair long and healthy. Janet likes to have her roots coloured every 3 weeks, (she won’t mind me sharing her secret - there are a few greys that need covering and her hair grows very quickly!) So 3 weeks later we opted for a ‘camouflage colour.’ With exactly the same root colour that I previously used, an inch either side of the parting and around Janet’s hairline is coloured. It’s a short appointment that keeps those roots in check until the full appointment is needed. 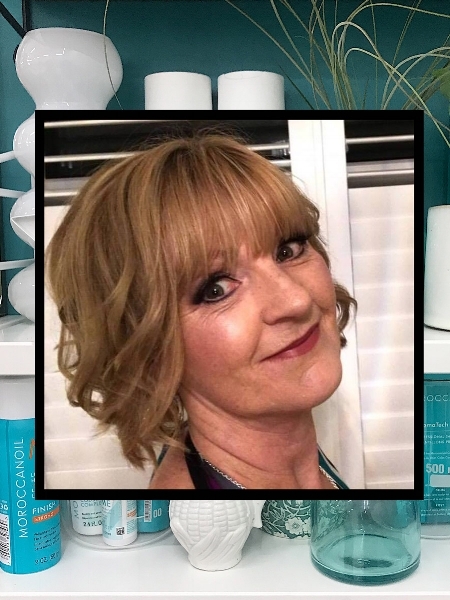 With 3 colour appointments until our summer transformation I used a mixture of toning, root covering and glossing to keep Janet’s hair looking fresh, keep the condition at its best and keep the cost down. Balayage doesn’t have the be refreshed every appointment, it’s amazing how a treatment and a toner can lift the colour back to its best. Fast forward to summer, and I lifted the blonde higher and brighter to give a natural, sun kissed, golden blonde hue. I re-balayaged, to add more blonde, however kept the balayage away from Janet’s hair line. The darker root colour is more flattering against Janet’s skin tone and we didn’t want the colour to look too artificial, as this can give harsher roots and look un-natural. This may work for some, but in this case we opted for subtle face framing colour. Janet loved her lighter look, so much so it saw her through wthe beginning of autumn. My intension was to carry out 4 transformations. (Spring, Summer, Autumn and Winter) However... Janet was really feeling her blonde locks! The warm weather rolled nicely in to Autumn and I wouldn’t dream of taking someone darker for my benefit, therefore we waited until Winter. When Janet felt ready for her next change we decided to use a mix of subtle and bright copper tones to add warmth and dimension. You’ll notice throughout the 3 photos, Janet’s root colour is very similar. As mentioned before, by keeping the colour consistent at the root and against Janet’s hairline, the transformation doesn’t feel like too much. To keep the tone bright at home, Janet will use a copper coloured conditioner and I would imagine going forward, we’ll go back to our treat & tone top up appointment’s before adding a light sprinkling of warm blonde when the clocks change! Myself and Janet aren’t the only one’s who love a seasonal hair overhaul, it keeps things interesting and as the saying goes, change is good! I love to work with my clients to keep their colours fresh, on trend and exciting and I hope this has shown you how you don’t have to go from one extreme to the other to achieve a new look. A single highlight and slight tone adjustment can contribute towards a huge colour change. If this is something you’re thinking about doing, get in touch. It was Christmas, then I blinked and now it’s nearly February. With my days at the salon being just as busy as they were in the lead up to Christmas, and 2 Moroccanoil trips to Dublin and Barcelona, I feel like my feet have barely touched the floor. January/February are notorious for being quieter in the hairdressing world due to most people wanting there hair done before Christmas. However I’ve being lucky enough to have my days filled with clients who I’ve known for years, but also I’ve had the time in my diary to look after 8 new clients. My new clients were all recommended to me and it’s so lovely to know my regular clients are sending their friends and family my way! The month started with an overnight stay in Dublin, tied in with our Moroccanoil post Christmas party. It’s always good to catch up with the Moroccanoil team, and the education put in place for us is by far some of the best training I’ve had. There wasn’t a hairdryer or product in sight for this one, it was to learn about our individual learning style as we will personally teach in the way we best learn. 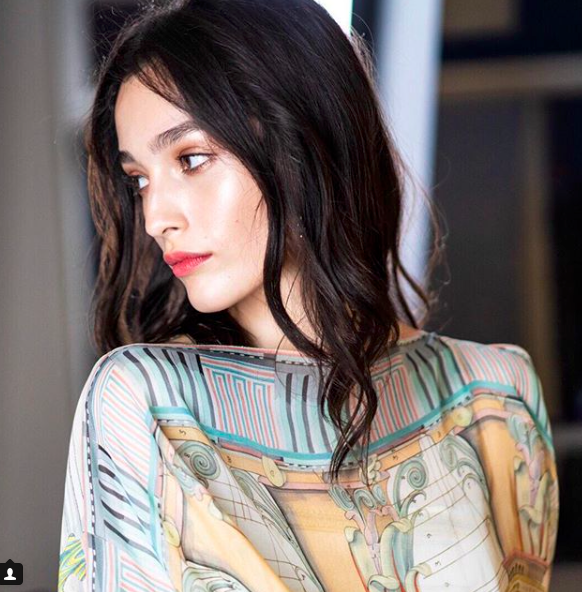 When I share Moroccanoil education with other hairstylists, it’s important everyone can understand and get involved in the way that suits their learning style. This course gave us tips on how to get everyone involved when we educate. Theorist/Reflector best describes my learning style, I’m someone who likes to make a decision based on the facts, and then spend (a lot of) time reflecting. That explains why on my return I wanted to find out EVERYONE’s learning style. I was still reflecting on my trip ya know?! Next up was Barcelona, for Moroccanoil’s ‘train the trainer’ event. Every year Moroccanoil’s education programme changes, the courses are updated and shared with the European team before we go and share them. I had 3 courses (Bridal, Knotwork and Editiorial) to learn in 3 days, with 2 hair cuts thrown in for good measure. 3 courses in 3 days may sounds like a lot of information to take it, but when you’re fueled by copious amounts of tapas and a small (to medium) amount of wine, it’s all good! I had a great trip, not only was it lovely to spend time with the team, I learn so much from them all. We all live in different parts of the U.K, but we manage to get together regularly for various work events. As far as January’s goes, it’s been a busy one. And with a busy February filled with appointments, education, and London Fashion Week amongst other things, it doesn’t look like we’ll be slowing down just yet! Luckily for me, hair is a big passion of mine. I’m forever watching hair related videos, reading articles and trying to better my knowledge on our industry. So much so, that my boyfriend probably knows a fair amount about hair due to subliminally listening to what I watch! My brain seems to store more imagery (beautiful colour formulations, and bouncy curls wrapped in silk scarfs!) and less science. Don’t get me wrong I love the science, but it would appear my brains ability to store such information less so. 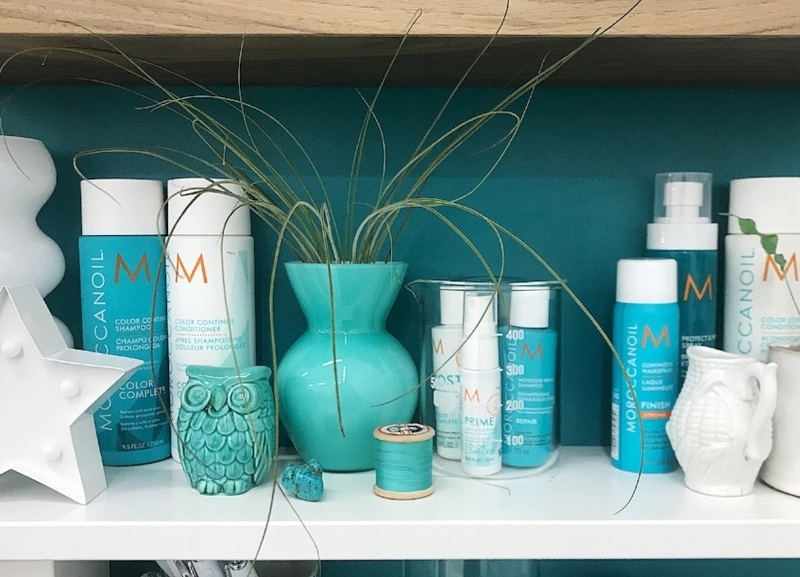 The launch of Moroccanoil Color Complete back in early autumn got me thinking about all the factors that contribute towards dryness and damage. When a client tells me their hair feels dry, I’m the first to blame the change in season. “Oh have you put the heating on? That will explain it!” I’ve noticed the I blame the heating, and general change in season a little too much when actually there’s a lot more too it, and this explains perfectly why your hair can feel dry at different points throughout the year. Environmental aggressors can cause damage to hair (and skin) daily, without you even realising. The first and one of the main culprits causing damage daily is UV light. You’d think living on this cold and windy island we call England we’d have no harmful UV light around at this time of year, but unfortunately that is not the case. If it’s light outside, the UV rays are very much there creating free radicals that over time oxide the lipids (the hydrating molecule) and the protein, the 2 main components that keep the hair strong. 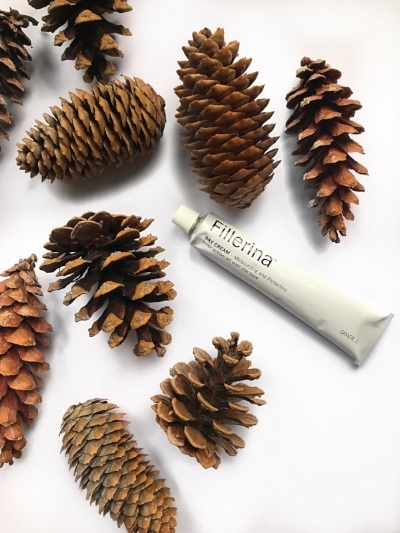 This not only has a drying effect on the hair, it can also cause discolouration, hence why a hot sunny holiday can cause extreme colour fade and brassiness. The second environmental aggressor that we are faced with daily is pollution. Tiny particles of dirt, dust and grime attach themselves to the hair and scalp like little magnets resulting in your hair looking dull, lifeless and scalp irritation. Pollution will make your hair feel heavy and the dirt will make your hair feel knotty and matted, most likely resulting in you washing and brushing it more than necessary. UV light and pollution teamed with all the small things we do daily, for example blow drying and styling, can over time contribute to our hair not feeling its best. I’m a fine haired girl with a life long love of bleach (I’ve tried to leave it, but I always go running back to it!) and as much as I care for my hair when colouring, bleach will ultimately make the hair more porous and therefore more susceptible to further damage. Because of this I need to treat my hair regularly, and recently I’ve been making an effort to use my Hydrating Mask when I wash my hair and my Protect and Prevent Spray daily to not only make my hair feel moisturised and soft, but in a quest to protect it from further damage. Sometimes (probably out of laziness) I can fall in to bad hair habits and not give mine the TLC it needs, however after the launch of Moroccanoil Colour Complete, I’m putting my all in to giving my hair what it really needs. Following on from last weeks blog I wanted to share with you my thoughts and finds since using my new Babyliss electricals over summer. I was already an avid Babyliss wand/tong collector (I need all sizes...obviously), but I had never used a Babyliss hairdryer. It was the Babyliss Italia Brava I started with and I was blown away (see what I did there?) by the power. Designed and built in cooperation with Ferrari, the Italia Brava guarantees exceptional blow-dry results every time. The lock-in turbo boost gives strong, precise air pressure, whilst MaxLifePRO brushless technology ensures a quieter hairdryer. Last but not least, the Ferrari designed motor means this dryer will give you up to 10,000 hours of use - when used daily, that’s 27 years of hair drying perfection! Faster, Quieter, Lighter, Longer - on paper it sounds incredible. I have been using the Italia Brava over Summer and I’m in love. My bouncy blowdrys seem bigger yet smoother, blow drying time has reduced, and the lighter dryer has definitely helped my aching shoulder! I’ve created 3 looks with my 3 favourite tools and I’ll start with ‘The Bouncy Blowdry’ created with the Babyliss Italia Brava. Helena naturally has thick, curly hair that’s prone to frizz. With the help of Moroccanoil we went for smooth volume. As I blowdried I left my brushes in and finished with a cool shot of air to set the movement in. Blowdried on a Saturday, Helena’s hair still looked amazing on Wednesday. Helena felt her hair looked smoother and shinier than usual, and I noticed this whilst blowdrying. ‘The Soft Curl’ was the second look created using the Babyliss Pro Titanium Expression Waving Wand (34mm.) I’d say this is the most mainstream look of the 3, and the easiest to create at home. To create this relaxed undone curl, I opted for smoother roots through my top section. Basically meaning I started wrapping the hair around the wand from half way down to give a soft sweeping curl. 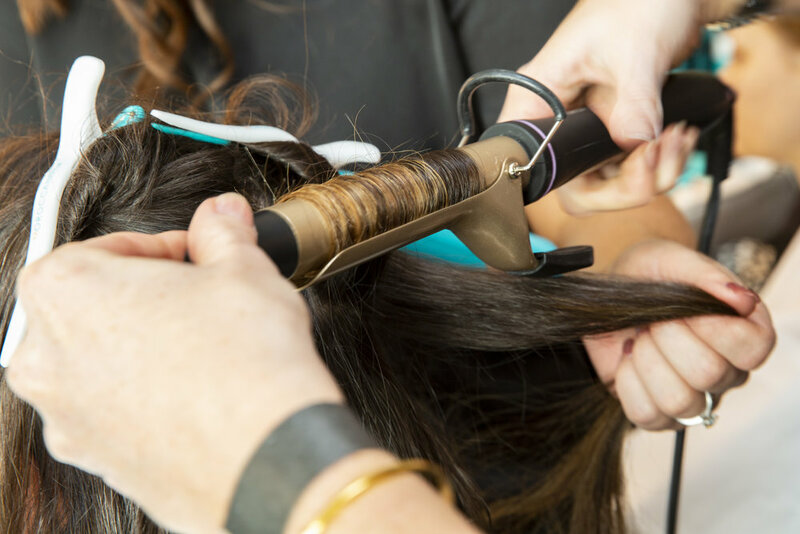 My top tip would be to catch the curl in your hand as you let it come away from the wand, to let the hair cool down before letting it fall in to place. If you let the hot hair fall instantly, the heat could instantly make your new curl drop. To finish and separate the curls I used a wide tooth comb and a light spritz off Moroccanoil Luminous Spray in medium hold. Last up and my favourite look of the 3 is ‘The Brushed Out Curl’ created using the Babyliss Pro Titanium Expression 16mm Curling Tong. It’s not often I create this kind of look in salon. But Maybe it’s time to bring it back, just in time for Christmas! You will see in my photos below before the curls were brushed out, they sit in perfect ringlets. By brushing them out a softer fluffier curl is created. Don’t be scared to brush out your curls. I always mist my brush with Moroccanoil Luminious Spray (Medium) before I brush out, to stop any hair going static. As much as this look will take a little longer than a loose curl, it’s a great look to elevate your usual style. 3 different looks, with 3 different tools, and I love them all. I love how the Babyliss Italia Brava blows volume through every curl whilst drying at a rapid speed. I love that I can create an everyday relaxed look with the Babyliss 32mm wand in under 10 minutes and I love how the Babyliss 16mm tong can create a curl in about 5 seconds flat. I hope you love ‘The Curl Collection’ I have created and if you’re a curly girl like me, I hope it inspires you to change your curls up! 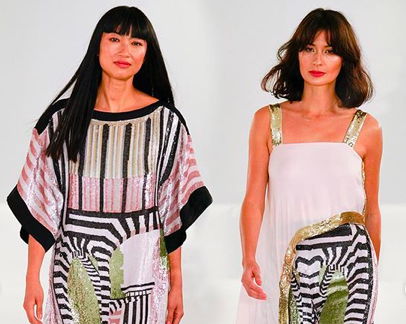 Back in July myself and four colleagues had the opportunity to attend an education hosted by Babyliss Pro at the Contè Nast College of Fashion and Design, London. ‘Backstage Story’ was the name, and learning session styling tips to bring back to the salon was the aim. Ben Hards is a celebrity session stylists, and counts Zayn Malik as one of his loyal clients. He owns an award winning salon, The Square, in Sevenoaks and is a guest artist for L’Oréal, Kerastase, Shu Eumura, Oribe and Babyliss Pro. Sam Burnett, owner of Hare & Bone, has recently opened his second salon giving him prime position in London and now Esher. At the age of 23 Sam won Newcomer of the Year at the British Hairdressing Awards (thats pretty big!) and since 2010 has worked as a freelance session stylist with his work featuring in Elle and InStyle to name but a few. When working backstage, you need to work quickly. There isn’t time for a 45 minute appointment per model like there would be in salon. To ensure time doesn’t run over you need good products and the best electricals. 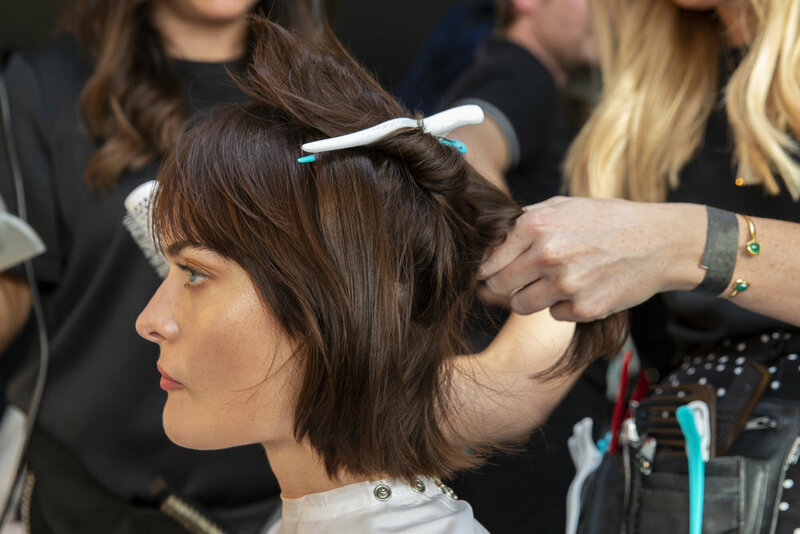 The Babyliss tongs/wands have always been my go to styler when working at LFW. They’re reliable, available in all sizes needed and most importantly they can create a curl in under 10 seconds. Babyliss had transformed the college in to a LFW backstage set up. With all electricals out ready, make up, clothes, a photographer and even a DJ it felt more like a party. After watching Ben and Sam create the looks we worked in pairs to recreate the styles and get our models ready for their photoshoot. In our industry there are no set rules when it comes to styling hair. There’s always room to learn and improve your skill and I’d highly recommend ‘Backstage Story - Session to Salon’ to anyone wanting to up their styling skills. If you cast your mind back to summer, you may remember some festival looks I created with my model Helena. The Babyliss event was the following week and Helena agreed to come to London and model. Her hair still pink from our festival looks, she definitely made an impact. Below are the two final images after her photoshoot. Thank you Babyliss for a great evening of education and thank you for stocking up my kit bag with an array of electricals . Since attending ‘Backstage Story’ I have not put my new hairdryer down. Check back next week to see some looks I have been creating along the way! To all the blondes who have experienced brassiness, this one is for you. Brunettes who find the tone and depth of their colour fade, this one is also for you. In fact, any one who has ever experienced colour fade of any kind, let me introduce you to Moroccanoil’s revolutionary new colour care collection, Color Complete. A 360 degree approach to colour care, addressing all the daily environmental issues that contribute towards colour fade to keep your colour looking just as good as it does at the start, until your next appointment. Starting at your colour appointment, we prep your hair with the ChromaTech Prime to eliminate scalp sensitivities and ensures the porosity of your hair is even from roots to ends for the most even colour result. After your colour has developed its time to lock the colour in with the ChromaTech Post, a finishing infusion of COLORLINK technology. Not only will this lock your colour in, it will leave your hair shinier and stronger than before. Next comes the ‘at home’ part. A 3 product regime including the Color Complete Shampoo, Color Complete Conditioner and the Protect and Prevent Spray. This system is scientifically proven to extend colour life and vibrancy by 100% after 10 washes. Color Complete features 2 proprietary technologies to ensure your colour stays vibrant whilst improving its health. ArganID, found in all the products, uses ionic attraction to deliver argan oil deep in to the cortex of the hair whilst locking in colour pigments. COLORLINK is the second, and this groundbreaking blend of 3 colour actives works on repairing hair from chemical and mechanical damage. But don’t let me bore you with anymore science, here are some reviews from my clients and friends who have helped me test Moroccanoil Color Complete before it launched! “Sometimes having blonde hair, it can be difficult to maintain the colour. I usually find that over time washing and styling my hair leads to it gradually becoming warmer and brassy in colour. Since last having my hair coloured, I have been using the Moroccanoil Color Complete Shampoo and Conditioner, as well as the Protect & Prevent Spray. I have to say these products have exceeded my expectations! The real test for me was going to be whilst I was abroad on holiday, and being faced with the usual challenges for my hair colour. The chlorine in the pool, the sea salt and of course, the intense heat and sunshine. It has now been seven weeks since having my hair coloured and I feel that it is still looking bright, fresh and it feels in great condition.” - Cheryl Dickinson. 4 months in to my pregnancy, my hair was the best it had EVER been. For someone who usually washes their hair every other day, I could get 5 days and not even have to dry style. (Don’t judge me, the tiredness was real!) My curls were bouncy, the shine was incredible and my natural oils had done a runner, because it just looked fresh at all times. I remember my Mum saying to me it wouldn’t stay like that, and it would probably start to fall out after I gave birth. I had seen this happen to others post pregnancy, but I just had the feeling it wouldn’t happen to me. Having ‘perfect’ hair during pregnancy and the first 3 months after were a God send. I didn’t have time to think about myself whilst looking after a new born. So the whole ‘good hair day everyday’ was a great help. A big shout out to Mother Nature for keeping my estrogen levels high and sorting me out. After pregnancy, estrogen levels drop. This is when the shedding begins. And gosh, it begun. I genuinely thought a spider was crawling down my back when it first started to fall out in the shower. It was however, just a rather large clump of hair making its way to the shower tray. This continued for a few months and I couldn’t believe how much I was losing. I was always pleasantly surprised when I blowdried my hair, as I expected to see bald patches. However when it started to grow back, I realised it was mostly lost from around my hair line. Not only did my hair shed. The natural oils returned and I’m back to styling my hair daily, and using a dry shampoo on day 2. (Maybe day 3 too!) As much as I knew hormones can affect hair, after experiencing these sudden changes personally, I can’t believe just how much they can. To keep my hair looking healthy whilst it was growing back, I have been having regular haircuts to keep a blunt shape. I have also been using The Eufora Thickening Collection. The collection comprises of 5 products, each formulated to ensure the scalp is at its healthiest, to encourage healthy hair growth. The hair loss continued for about 6 months, however fast forward another 6 months and my hair is back to its best. The condition feels good, it feels thicker and my post pregnancy hairline is now at a length where it no longer flys in the wind. All I have to worry about now is my super strong one year old pulling it out! Picture this - it’s 7pm at The Natural History Museum. The champagnes flowing and the atmosphere buzzing. London’s iconic Museum has been transformed into the party place to be. 650 hairdressers and industry greats all dressed to impress for one of the main events in the hairdressing calendar, The Creative Head It List and Most Wanted awards ‘18. Errol Douglas MBE couldn’t be missed in a bright red blazer, whilst Sophia Hilton wowed in an embellished black dress, her signature yellow hair styled to perfection. There’s excitement in the air and the entrance to the museum is quickly filling with guests dressed to impressed. Our industry is a creative one, and this creativity definitely shone through. 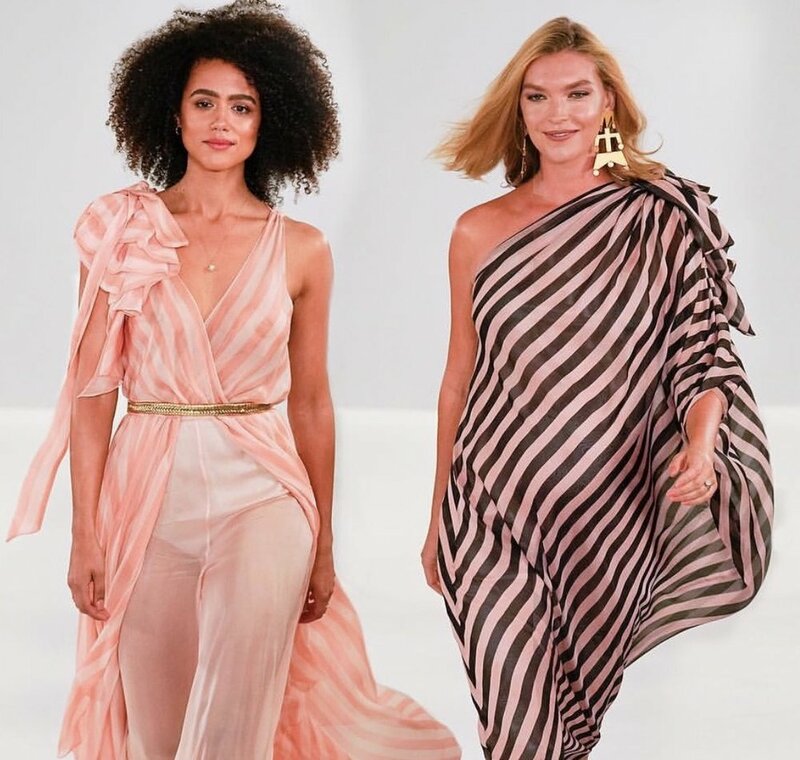 With beautiful ballgowns, one of a kind suits and hair backcombed to new heights, it’s the perfect occasion to dress up, show your individual style and celebrate hairdressing with like minded, fun people. The prestigious event sold out in under 5 minutes and as finalists in the ‘Best Local Salon’ category we were lucky enough to be in attendance. Cocktails and canapés to start in Fossil Way, followed by a 3 course dinner in Hintze Hall. Surrounded by truly stunning architecture and dining beneath the skeleton of a 25 metre blue whale made this awards ceremony such a surreal evening. With category’s including ‘Award for Innovation’ and ‘Best Salon Experience’ it was a great opportunity to see what others are doing to set themselves apart and really stand out. Best Salon Experience was won by Stil. A Scandi inspired salon nettled in Notting Hill. Whilst Stewart Roberts won the Award for Innovation. Stewart set up Haircuts4Homeless back in 2014 after seeing a video of a man cutting hair for the homeless in New York. He now has 300 volunteers in 45 locations and has issued over 35,000 haircuts. “You have never really lived, until you have done something for someone who can’t repay you.” A haircut for a homeless person isn’t just a haircut, it’s talking to someone for 45 minutes, it’s being listened too and time away from everyday life. It was clear to see Stewart felt overwhelmed upon receiving this award, but for me this was the stand out award of the evening. We made it to the final for ‘Best Local Salon.’ Our entry put together by Ben Hunt to showcase the work we do for people in our local community. One of our stylists Jan, spends her Sunday Mornings in Guildford working with a charity called Greenlight cutting hair for the homeless. 2 years ago Val teamed up with Regenerate Rise. A charity with a mission to eradicate isolation within the U.K, Val welcomed a group of elderly ladies to the salon for a pampering day with our apprentices followed by afternoon tea in our local cafe, Randall’s. An opportunity for these ladies to have a great day out, something they can’t do on their own. It’s not until you hear about charities like Regenerate Rise that you realise how lucky you are to be surrounded by family and have people to talk to every day. As a salon we have raised over £82,000 for various charities and with our next charity event coming up in October, wouldn’t it be great to push that figure well in to the £90k?! We didn’t win ‘Best Local Salon’ however when you break down everything we do as a team it really was the taking part over the year’s that counts and doing what we do for others that really matters. The Creative Head It List and Most Wanted awards was an opportunity for us to spend time together as a team, catch up with our friends with in the industry and it’s safe to say we all left feeling inspired and maybe ever so slightly merry! If you’re not familiar with Eufora, they’re a product brand we have used and retailed at Pure Hair for 5 years. Like all the products we stock, Eufora deliver amazing results and I wanted to share the reasons I love Eufora, the products and the brand. Firstly Eufora products are 65-85% organic certified, pharmaceutical grade aloe vera. Aloe vera has huge benefits in its raw form. 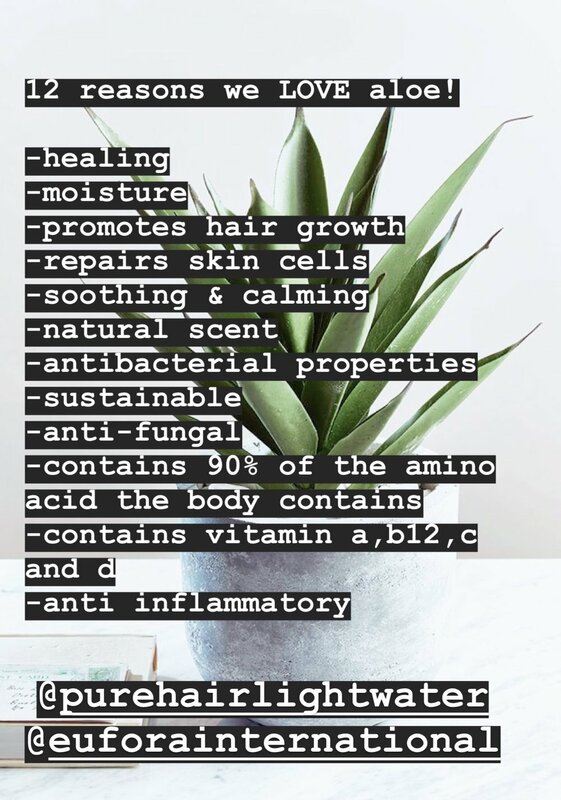 Packed full of vitamins and containing 90% of the amino acids our body is made of, this makes aloe one of the best ingredients to moisturise the hair, scalp and skin. Aloe is well known for its great healing properties and is often used on burns to help the skin recover. The aloe used in every Eufora product is the best quality, meaning by the time it reaches your hair, scalp and skin, you still reap every benefit. With the moisturising, vitamin packed base in place, the next ingredient to think about is protein. Oat, wheat, soy and quinoa are the 4 naturally derived protein’s Eufora use. These ingredients each have a different molecular weight, and are used in the different products depending on the products purpose. By using naturally derived proteins this means the hair will never become over proteinised. If too much artificial protein is used on the hair, the hair won’t know how to behave and sometimes this can have an adverse effect and lead to brittleness. The natural proteins used by Eufora means this won’t happen. 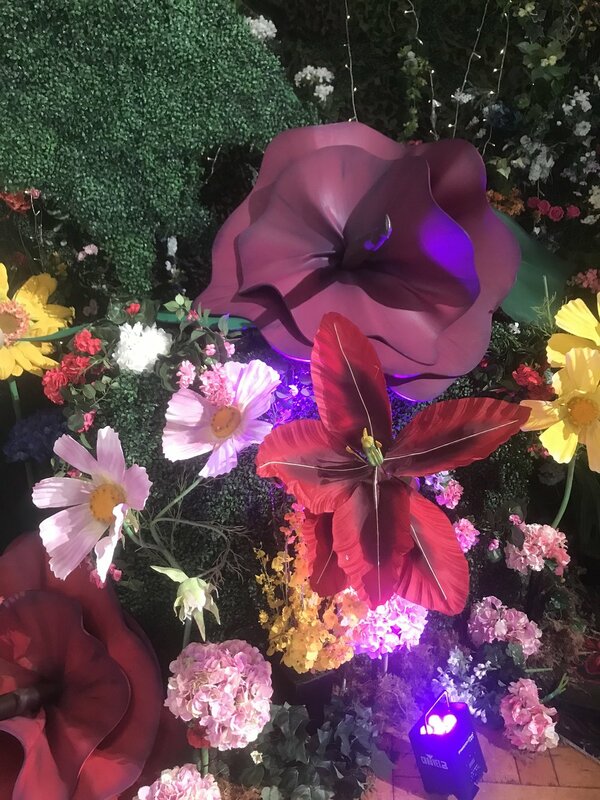 How beautiful the fragrance is, is often a talking point when using Eufora. Every ingredient in every product has been used because it benefits the hair, scalp or skin. The fragrance you smell hasn’t been added to heighten the scent. The fragrance you smell has been naturally derived from an essential oil that serves a purpose and has a benefit. Every product smells different and I would describe the Eufora scents as light, natural and fresh. Aloe is a natural preservative, so this means Eufora only have to use a small amount of preservative in their products to ensure the product delivers from the first use to the last. The preservatives used are all food grade, so once again only the best ingredients are being used. This is just the start of what makes Eufora special. In my next blog, I’d like to show you some of the unique ways I use their products. Eufora as a company are very special. As I previously mentioned we have worked with Eufora for 5 years. I have been lucky enough to attend 2 of their events in San Diego: A self development/business course and a product knowledge/hairdressing skills course a year later. The Eufora family took us under their wing to ensure we had the best training possible. We were taken to meet their Chemist, James Grundy, so he could answer any of our questions. Shown around their HQ and made to feel so welcome. (They know how to throw a good party too! )The people behind the product really care, and that’s the kind of product I want to use. Now I can’t be the only one looking forward to this weekends pending nuptials at Windsor Castle. It’s been so lovely to see such positive news in the build up to Prince Harry and Meghan’s wedding. The sunshine and lighter evenings have set us all in good stead for the weekend - and regardless of if you’ll be watching the Royal Wedding - I hope the sunshine continues so we can all enjoy a Pimms in the garden. I’ll be working Saturday, but I can’t wait to see photos. Meghan will undoubtedly look stunning, and obviously I can’t wait to see her hair. Not only do we have the Royal Wedding (15 minutes down the road!) I have organised a mini hen do for a very good friend on Sunday. My weekend will be wedding focused, spent with good people & eating good food with lots of laughs. All this wedding talk has got me thinking about wedding hair I have created in the past, and what amazing experiences I have had with both clients and friends on the morning of their big day. I have visited some incredible locations and met some amazing people along the way. I wanted to share with you some of my fondest wedding memories. I have been colouring and cutting Niquita’s hair for about 6 years now. I remember her first appointment well. Niquita came in blonde and was looking for a darker root shadow to keep her colour low maintenance for her up and coming travels. On her return she came back to see me and still now, travels down from Oxford for regular appointments. We share a love for nice holidays, pretty jewellery and good afternoon tea! We never do the same colour twice, and Niquita always tells me she loves the colour before I’ve even combed it through! (You know the stage where you sit in the mirror, and your hair just looks wet and dark!) Niquita & James married at Berkeley Castle, Gloucestershire, in 2016. When she asked me if I’d do the drive to style her hair for the wedding, I didn’t even have to think about it. I had a brilliant morning plaiting, curling and fixing fresh flowers in Niquita’s hair. I also looked after 5 of her beautiful bridesmaids. They all had different styles, however we incorporated plaits and twists in every style to keep the relaxed, boho theme consistent. The girls looked stunning, and the venue was like something out of a fairytale. I’m so glad I was part of Niquita’s wedding morning. The most recent wedding I have had the pleasure of attending, was Katie and Steve’s wedding at The Bell Inn, Ticehurst. A beautiful pub wedding in an idyllic Village setting. I say ‘pub’ loosely, as the venue was like no pub I have ever visited. With quirky hotel bedrooms, outdoor rustic lodges and an impressive dance floor, I can see why The Bell was Katie and Steve’s chosen venue. I saw Katie 2 days before her wedding for a balayage refresh and believe it or not, a wedding hair trial! 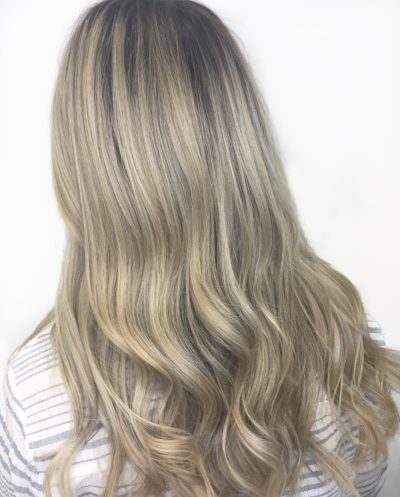 Katie has the most amazing hair, and it was only right to leave it down to show off the beautiful ash tones and never ending length! Katie opted for relaxed waves and lots of texture complimented by a beautiful veil. 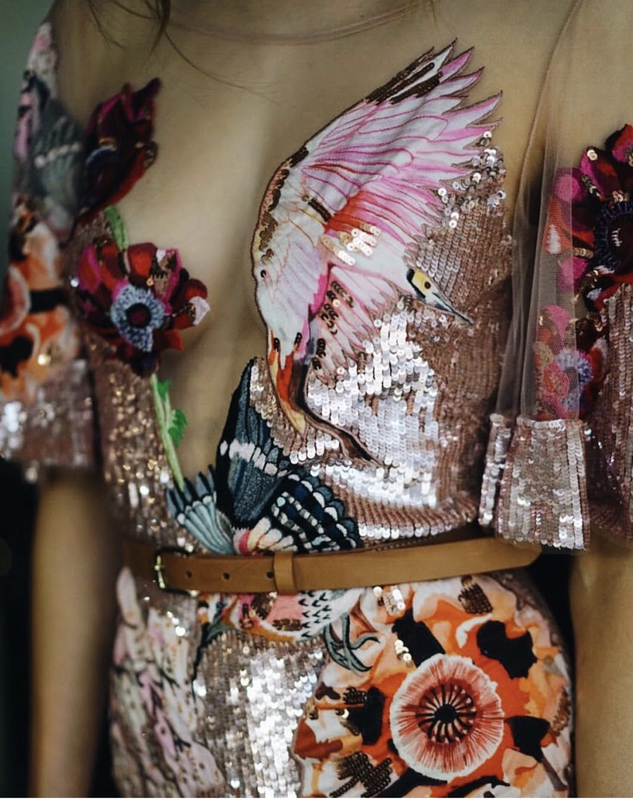 I couldn’t wait to see Katie’s dress, we share a similar taste in fashion and I just knew it was going to be one of the most amazing dresses I’d even seen. Katie wanted her bridesmaids to feel comfortable, therefore they all decided how they would wear their hair. From a sleek blowdry to a textured pixie cut, each bridesmaid had a completely different look. I’m still feeling the buzz from Katie’s wedding morning 3 weeks on. I can’t wait to catch up on our next appointment. Last year on June 30th, I attended a very important wedding in Tuscany, Italy. My best friends, Stacey and Dan, tied the knot at the most wonderful ceremony surrounded by close friends and family up in the Tuscan Hills. Up until the last minute, we were unsure if we’d actually make the wedding. My son was due to be born on June 7th. To keep me on my toes (as I’m sure he will for the next 18 years!) Arlo arrived on June 16th. Arlo’s passport arrived 2 days before our flight and we made it! Stacey was extremely relaxed about her hair and told me to do what ever I wanted. I told her it was absolutely necessary to do a trial in the build up, I’m pretty sure she only agreed to a trial to keep me happy! We had such a relaxed morning by the pool, we didn’t actually spend a huge amount of time getting ready. I celebrated my best friends wedding in Italy with my 2 week old son. That’s a wedding I definitely won’t forget! Following on from my ‘Moroccanoil Top 5’ last week, I thought it would be pretty fun to interview their Creative Global Ambassador, Antonio Corral Calero. Antonio’s been with Moroccanoil since day one and has played a huge part in growing the greatest oil infused brand on the market. Not only working for Moroccanoil, Antonio has recently opened his own Academy in Barcelona - Factory 236. With a huge global role and his own Academy, I wasn’t sure Antonio would have the time to be interviewed. But it was no problem, and for that I will be forever grateful! So here it is... An interview with Antonio Corral Calero! Antonio, as Moroccanoil’s Creative Global Ambassador you are constantly travelling. You can cover New York, London and Barcelona in 1 week! What are you top tips for keeping your body and mind healthy when travelling this much? I tried to keep a good balance by eating well and walking everywhere. I find walking clear’s my mind whilst also burning some of those extra calories from all the goodies I can’t resist! I start the morning with some meditation and positive thinking, followed by hot water with lemon - 2 cups! After a coffee I’m ready to go. Then I find a cold press juice bar. I’ll have a large mix of vegetable’s, apple and ginger. Then I feel like superman, anywhere in the World! On the subject of travelling what’s your favourite country and why? That’s a difficult one, because there are so many beautiful places in the world. I love Asia! Thailand and Bali are at the top of my list. I’m a big fan of Thai food and I had an amazing experience in Bali, being in touch with my inner self. You inspire lots of hairdressers around the world, myself included. Who would you say your inspiration is and why? I can’t name anyone. I don’t know if that’s a good thing, but everyone inspires me! Not just in the industry, but random people in the street. If I inspire people I hope it’s not just for my work but because of the person I am. If you had to pick one Moroccanoil product for personal use, what would it be? It would have to be Moroccanoil's Smoothing Lotion because of the products versatility. It makes my hair looks beautiful from Winter to Summer. I can apply it and let it be, or straighten my curls and my hair still looks natural. Not only are you Moroccanoil’s Creative Global Ambassador, you have recently opened your very own academy in Barcelona - Factory 236 - how are you finding juggling these 2 huge roles? GIRLLLL, I don’t even know! Well I do know, Nicolas Guzman. He’s my partner in life and Business. He manages all the agenda’s and puts some sense into my world . Everything I do, I do it with love and good will. I am me and I don’t try to be anyone else. One thing you and I have in common is that we have a passion for what we do, and we can do things our way whilst thinking of and helping other’s along the way.